Rare White on Black newer body style Audi S4. This is a clean Carfax, 2 owner, west coast vehicle sold as a certified pre-owned @ Audi to the second owner. So both owners spent a lot of money on this car, and both owners had it under a bumper to bumper warranty which is also a great part of a cars history on any car. That's when you know anything that went wrong with the car was taken care of right away, as opposed to someone who didn't have a warranty and never went in to get things fixed in a timely fashion. When you wait to get things fixed it typically leads to bigger problems, and typically ones without warranty are the ones to wait. The way this car drives is a direct result of the way the two previous owners took care of this amazing machine. The car is in showroom condition inside and out and looks like a brand new car. 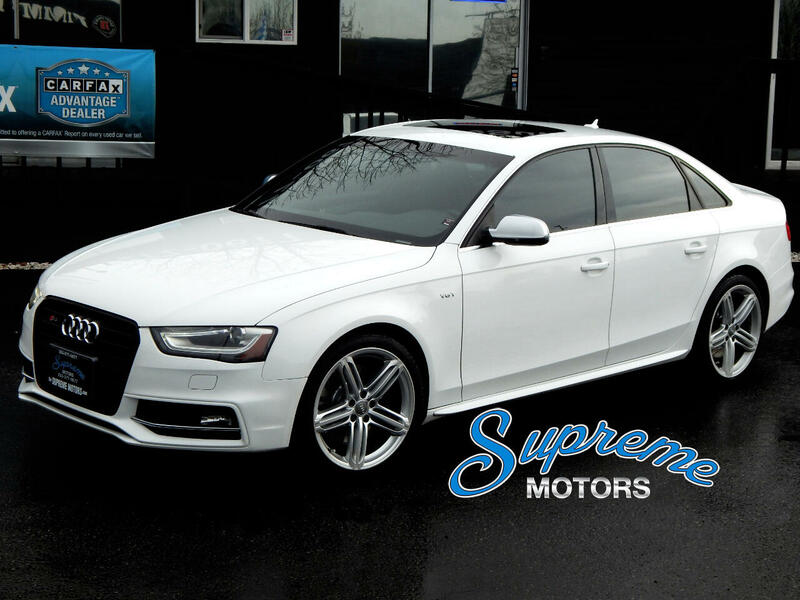 The white on black color combination in Audi's is highly sought after, and to find a white on black S4 under $30k is nearly impossible, let alone a clean Carfax with no blemishes, incredible service history, and ALL the right options. This S4 has the prestige wheel package which is a must and look much much better than the other wheel options on S4's. They are wrapped around with continental tires all the way around with 75% tread. We also put BRAND NEW crossed drilled and slotted rotors all the way around and pads all the way around. That is $1000 value that feels good driving off in a high performance machine. Another high value option that is a must on the S4 is the Bang & Olufson sound system. This sound system is second to none and sounds like a live symphony inside the car. It is ridiculous. Also comes with Full leather racing seats that look like they have hardly been sat in if at all. Navigation, back up camera, heated seats, sunroof, Bluetooth, S-Steering wheel, and more. This S4 checks every single box for it to be in the "unicorn in the market" status, which means you never see them with all these attributes combined for sale. call soon because spring and summer are coming and it will be a heck of summer in this bad boy.